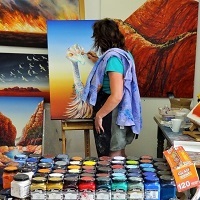 Wide Bay Gallery in Maryborough Qld will be hosting a weekend workshop featuring Matisse Derivan Acrylics and Mediums. With all product donated by Matisse, this workshop is a great opportunity to come and try a large range of products and explore the huge range of effects that can be created under Linda’s step by step guidance..
Acrylic painting mediums allow you to use acrylics in an endless variety of ways from wet on wet to heavy impasto work. It can be challenging to work out which mediums to use. In this two day intensive workshop you will get to play with a large range of mediums and explore the creative ways in which they can be used. Learn how each medium works and which mediums can be intermixed and which ones can’t. Learn various methods for creating textures, cracking, rust and patina. Learn how to combine and layer the techniques to produce and endless variety of effects. Participants will complete a number of small step by step projects, experiment with a large range of products and make an Acrylic Paintings Mediums sample chart to take home. Part of this workshop is about discovering when to “let the medium do the work” and when some gentle persuasion is required. Most importantly it is just about having fun and seeing where the journey takes you. With workshops notes provided this course provides a whirlwind tour through the world of acrylic mediums and a whole lot of fun.